The fresh, sophisticated, and classic masterpiece, Citizen Kane (1941), is probably the world's most famous and highly-rated film, with its many remarkable scenes and performances, cinematic and narrative techniques and experimental innovations (in photography, editing, and sound). Its director, star, and producer were all the same genius individual - Orson Welles (in his film debut at age 25! ), who collaborated with Herman J. Mankiewicz on the script (and also with an uncredited John Houseman), and with Gregg Toland as his talented cinematographer. [The amount of each person's contributions to the screenplay has been the subject of great debate over many decades.] Toland's camera work on Karl Freund's expressionistic horror film Mad Love (1935) exerted a profound influence on this film. The film, budgeted at $800,000, received unanimous critical praise even at the time of its release, although it was not a commercial success (partly due to its limited distribution and delayed release by RKO due to pressure exerted by famous megalomaniac publisher W.R. Hearst) - until it was re-released after World War II, found well-deserved (but delayed) recognition in Europe, and then played on television. The film engendered controversy (and efforts at ruthless suppression in early 1941 through intimidation, blackmail, newspaper smears, discrediting and FBI investigations) before it premiered in New York City on May 1, 1941, because it appeared to fictionalize and caricaturize certain events and individuals in the life of William Randolph Hearst - a powerful newspaper magnate and publisher. The film was accused of drawing remarkable, unflattering, and uncomplimentary parallels (especially in regards to the Susan Alexander Kane character) to real-life. 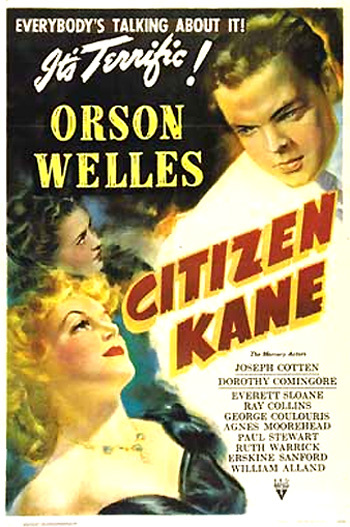 The notorious battle was detailed in Thomas Lennon's and Michael Epstein's Oscar-nominated documentary The Battle Over Citizen Kane (1996), and it was retold in HBO's cable-TV film RKO 281 (1999) (the film's title refers to the project numbering for the film by the studio, before the film was formally titled). The gossip columnist Louella Parsons persuaded her newspaper boss Hearst that he was being slandered by RKO and Orson Welles' film when it was first previewed, so the Hearst-owned newspapers (and other media outlets) pressured theatres to boycott the film and also threatened libel lawsuits. Hearst also ordered his publications to completely ignore the film, and not accept advertising for other RKO projects. However, the title character Charles Foster Kane is mostly a composite of any number of powerful, colorful, and influential American individualists and financial barons in the early 20th century (e.g., Time Magazine's founder and mogul Henry Luce, Chicago newspaper head Harold McCormick, and other magnates of the time). By contrast, the real-life Hearst was born into wealth, whereas Kane was of humble birth - the son of poor boarding-house proprietors. And Kane also was separated from both his mother and his mistress, unlike Hearst. Welles' film was the recipient of nine Oscar nominations with only one win - Best Original Screenplay (Mankiewicz and Welles). The other eight nominations included Best Picture (Orson Welles, producer), Best Actor and Best Director (Welles), Best B/W Cinematography (Toland), Best Art Direction (Perry Ferguson and Van Nest Polglase), Best Sound Recording (John Aalberg), Best Dramatic Picture Score (Bernard Herrmann with his first brilliant musical score), and Best Film Editing (Robert Wise). With his four Academy Awards nominations, Welles became the first individual to receive simultaneous nominations in those four categories. The less-lauded John Ford picture How Green Was My Valley (1941) won the Best Picture honor. Many of the performers from Orson Welles' Mercury Theatre group made their screen debuts in the film, among them Joseph Cotten (Kane's oldest and best friend, and his newspaper's drama critic), Dorothy Comingore (Kane's second wife), Ruth Warrick (Kane's first wife), Ray Collins (Kane's political opponent), Agnes Moorehead (Kane's mother), Everett Sloane (Kane's devoted and loyal employee and business manager), Erskine Sanford (the newspaper's editor-in-chief), Paul Stewart (Kane's butler), George Couloris (Kane's legal guardian and bank manager), and William Alland (the chief investigative reporter). Its complex and pessimistic theme of a spiritually-failed man is told from several, unreliable perspectives and points-of-view (also metaphorically communicated by the jigsaw puzzle) by several different characters (the associates and friends of the deceased) - providing a sometimes contradictory, non-sequential, and enigmatic portrait. The film tells the thought-provoking, tragic epic story of a 'rags-to-riches' child who inherited a fortune, was taken away from his humble surroundings and his father and mother, was raised by a banker, and became a fabulously wealthy, arrogant, and energetic newspaperman. He made his reputation as the generous, idealistic champion of the underprivileged, and set his egotistical mind on a political career, until those political dreams were shattered after the revelation of an ill-advised 'love-nest' affair with a singer. Kane's life was corrupted and ultimately self-destructed by a lust to fulfill the American dream of success, fame, wealth, power and immortality. After two failed marriages and a transformation into a morose, grotesque, and tyrannical monster, his final days were spent alone, morose, and unhappy before his death in a reclusive refuge of his own making - an ominous castle filled with innumerable possessions to compensate for his life's emptiness. In a succession of views, the subjective and curious camera, acting omnisciently as it approaches toward the castle, violates the "No Trespassing" sign by entering the neglected grounds. In the private world of the castle grounds, zoo pens have been designed for exotic animals. Spider monkeys sit above a sign on one of the cages marked 'Bengal Tiger.' The prows of two empty gondolas are tied to a wooden wharf on a private lake, and the castle is reflected in the water. A statue of the Egyptian cat god stands before a bridge with a raised drawbridge/portcullis over a moat. A deserted green from the large golf course is marked with a sign needing repair (No. 16, 365 yards, Par 4). In the distance, a single, postage stamp-sized window of the castle is lit, always seen at approximately the same place in each frame. Palm trees surround a crumbling gate on the abandoned, cluttered grounds. The castle appears in a closer, medium shot. During an even closer shot of the window, the light within the window suddenly goes out. From an angle inside the turret room facing out of the enormous window, a silhouetted figure can be seen lying stiffly on a bed in the low-lit room. [In reality, no one would have heard Kane's last utterance - in this scene, he is alone when he dies, although later in the film, Raymond the butler states that he heard the last word - a statement not completely reliable. It has been speculated that everything in the film was the dying man's dream -- and the burning of Rosebud in the film's climax was Kane's last conscious thought before death.] An old man has pronounced his last dying word as the snowstorm globe is released from his grip and rolls from his relaxed hand. The glass ball bounces down two carpeted steps and shatters into tiny pieces on the marble floor. [The film's flashbacks reveal that the shattering of the glass ball is indicative of broken love.] A door opens and a white-uniformed nurse appears on screen, refracted and distorted through a curve of a sliver of shattered glass fragment from the broken globe. In a dark silhouette, she folds his arms over his chest, and then covers him with a sheet. The next view is again the lit window viewed from inside. A dissolve fades to darkness. Narrator of Newsreel: Legendary was the Xanadu where Kubla Khan decreed his stately pleasure dome. Today, almost as legendary is Florida's Xanadu, world's largest private [views of people lounge around Xanadu and its pool] pleasure ground. Here, on the deserts of the Gulf Coast [the camera views the coastline], a private mountain was commissioned and successfully built. [Workmen are shown building the tremendous castle] One hundred thousand trees, twenty thousand tons of marble are the ingredients of Xanadu's mountain. Contents of Xanadu's palace: [crates with statues and other objects are brought into Xanadu] paintings, pictures, statues, the very stones of many another palace - a collection of everything so big it can never be catalogued or appraised, enough for ten museums - the loot of the world. [views of endless numbers of crates arriving] Xanadu's livestock: [views of horses, giraffes, rare birds, a large octopus, an elephant, donkeys, etc.] the fowl of the air, the fish of the sea, the beast of the field and jungle. Two of each, the biggest private zoo since Noah. Like the pharaohs, Xanadu's landlord leaves many stones to mark his grave. Since the pyramids, Xanadu is the costliest monument a man has built to himself. In Xanadu last week was held 1941's biggest strangest funeral. Kane's coffin emerges from Xanadu as it is borne by coffin-bearers. Narrator: Here in Xanadu last week, Xanadu's landlord was laid to rest, a potent figure of our century, America's Kubla Khan - Charles Foster Kane. Stormy Career Ends for "U.S. Fascist No. 1"
El Sr. Kane Se Murio! To forty-four million U.S. news buyers, more newsworthy than the names in his own headlines, was Kane himself, greatest newspaper tycoon of this or any other generation. Narrator: Its humble beginnings in this ramshackle building, a dying daily. [Views of the old Inquirer Building] Kane's empire in its glory [A picture of a US map shows circles widening out over it] held dominion over 37 newspapers, two syndicates, a radio network, an empire upon an empire. The first of grocery stores, paper mills, apartment buildings, factories, forests, ocean liners, [a sign reads COLORADO LODE MINE CO.] an empire through which for fifty years flowed in an unending stream the wealth of the earth's third richest gold mine. [Piles of gold bullion are stacked up and a highway sign reads, COLORADO STATE LINE] Famed in American legend [Kane Jr. is pictured with his mother in a framed portrait] is the origin of the Kane fortune, how to boarding house keeper Mary Kane [a view of Kane's old home, Mrs. Kane's Boarding House] by a defaulting boarder in 1868 was left the supposedly worthless deed to an abandoned mine shaft - the Colorado Lode. [A large bucket tilts, pouring molten ore into a mold] Fifty-seven years later, [A view of the Washington DC Capitol Building] before a Congressional investigation, Walter P. Thatcher, grand old man of Wall Street, for years chief target of Kane papers' attacks on trusts, recalls a journey he made as a youth. In front of a Congressional investigating committee, Walter Parks Thatcher (George Coulouris) recalls his journey in 1870 to Mrs. Kane's boarding house in Colorado, when he was asked to raise the young boy. My firm had been appointed trustee by Mrs. Kane for a large fortune which she had recently acquired. It was her wish that I should take charge of this boy, this Charles Foster Kane. Mr. Charles Foster Kane, in every essence of his social beliefs, and by the dangerous manner in which he has persistently attacked the American traditions of private property, initiative, and opportunity for advancement, is in fact, nothing more or less than a Communist! The words of Charles Foster Kane are a menace to every working man in this land. He is today what he has always been - and always will be - a Fascist! Narrator: And still, another opinion. I am, have been, and will be only one thing - an American. All of these years he covered, many of these he was. Few private lives were more public. Narrator: Twice married, twice divorced. [Kane and first wife Emily are dressed in wedding clothes, walking outside the White House] First to a president's niece, Emily Norton, who left him in 1916. [A newspaper article reads: "Family Greets Kane After Victory Speech" - his wife and young son are pictured with him outside Madison Square Garden] Died 1918 in a motor accident with their son. Sixteen years after his first marriage, two weeks after his first divorce, [At the Trenton Town Hall, newspaper reporters and photographers crowd around when Kane comes out with Susan] Kane married Susan Alexander, singer at the Town Hall in Trenton, New Jersey. [A poster from one of Susan's performances: "Lyric Theatre, On Stage, Suzan Alexander, Coming Thursday"] For Wife Two, one-time opera singing Susan Alexander, Kane built Chicago's Municipal Opera House. [The cover of an opera program: "Chicago Municipal Opera House presents Susan Alexander in Salammbo, Gala Opening" and a drawing of the Opera House] Cost: $3 million dollars. Conceived for Susan Alexander Kane, half finished before she divorced him, the still-unfinished Xanadu. Cost: No man can say. In politics - always a bridesmaid, never a bride. The Highly Moral Mr. Kane and his Tame "Songbird"
...Shameful. Ignominious. Defeat that set back for twenty years the cause of reform in the U.S., [heart-shaped framed pictures of Kane and Susan are pictured in the newspaper] forever cancelled political chances for Charles Foster Kane. [A sign on a gate reads: FACTORY CLOSED, NO TRESPASSING]  [Another sign reads: CLOSED] [The signs repeat the theme of closure/death from the film's opening shot.] Then, in the first year of the Great Depression, a Kane paper closes [On the St. Louis Daily Inquirer building hangs a CLOSED sign]. For Kane in four short years: collapse. [On a map of the US, the circles diminish, leaving only a few] Eleven Kane papers merged, more sold, scrapped. But America Still Reads Kane Newspapers and Kane Himself Was Always News. Kane: Don't believe everything you hear on the radio. [A sly reference to Welles' own infamous 1938 radio broadcast of The War of the Worlds that sent listeners into a panic.] Read the 'Inquirer'! Kane: I'm always glad to be back, young man. I'm an American. Always been an American. (Sharply) Anything else? When I was a reporter, we asked them quicker than that. Come on, young fella. Kane (smugly): I've talked with the responsible leaders of the Great Powers - England, France, Germany, and Italy - they're too intelligent to embark on a project which would mean the end of civilization as we now know it. You can take my word for it. There'll be no war. In the next newsreel clip, Kane is seen at a cornerstone ceremony, clumsily dropping mortar on himself from a trowel, and then brushing the dirt off his coat. At the center of the ceremony as he lays a cornerstone, but without his customary power, he is surrounded by workmen swinging hooks and cables around him.